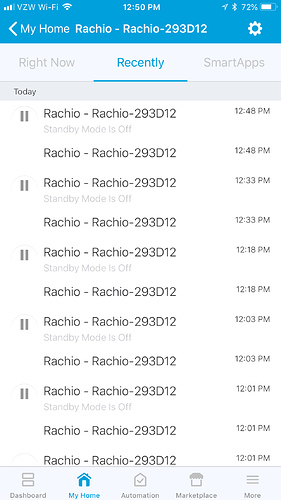 I may have missed something somewhere, but I am trying to figure out how I can get some status / history of what Rachio is doing in SmartThings via the Smart Home Monitor. This is basically the “Hello Home” where logs of what is happening and any alerts are given to you in a timeline. Ideally I would like to be able to see when my Rachio 3 had run and of course if there were any alerts/warnings. This would be similar to the app alerts I get on the iOS app but inside ST. 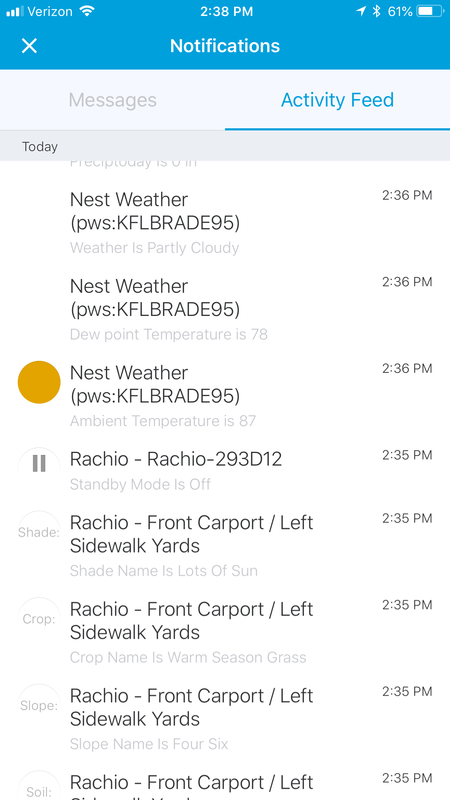 I don’t see any options in the Rachio ST app to configure alerting which seemed odd. 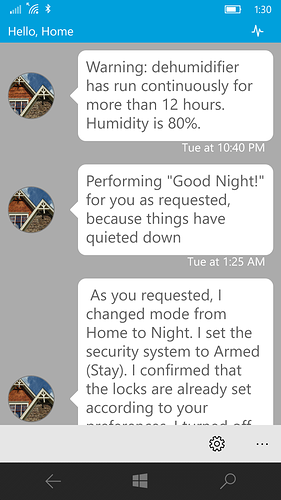 The Smartthings SHM is for home security (alarm panels, door/motion/smoke sensors, etc). You won’t be able to monitor Rachio there. 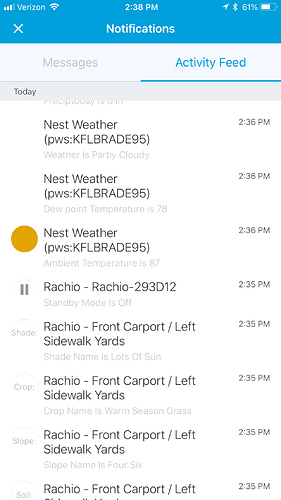 If you need to see Rachio activity in Smartthings, the best place would be on the device screen for your controller and/or the device screen for the zone. Best place to see Rachio activity would still be in the official Rachio App on the history screen, IMHO. Well, all the rest of my device or smart app alerts show up there. It’s not really the SHM per se but it is the logging portion. In the ST app this used to be called “Hello, Home”. Maybe a different approach is: I want to get push alerts in the ST app about what Rachio is doing. These will be logged there along with the rest. Using separate apps falls flat - think single pane of glass. Plus I actually rarely use the Rachio app and instead opt for the web interface. Plus when I had the Rachio app it seemed very chatty and only has coarse on or off settings. 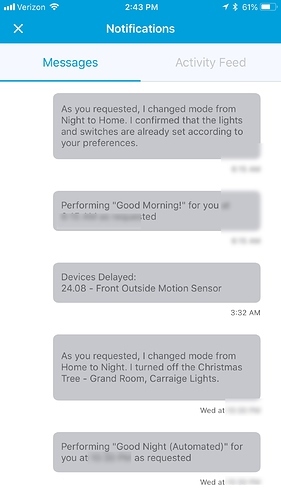 If Rachio doesn’t have some way to do this it would be disappointing since it is such a very basic thing. 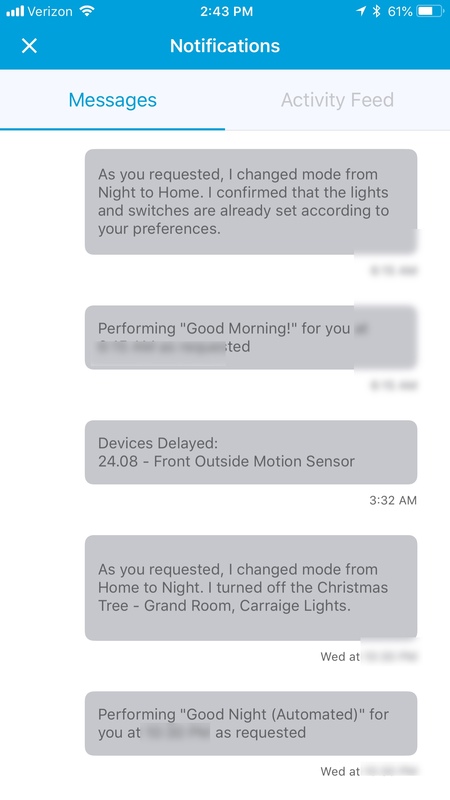 Honeywell does it, Arlo does it, Philips does it so other than simply not trying I can’t think of any reason why the Rachio Smartapp doesn’t. It also begs the question as to why there even is a ST integration because “turning on the sprinklers when the neighbor’s dog comes into the yard” is so an edge case. Getting an alert that you have a failure or whatnot is a central use case. I was hoping that better coverage might exist, say, in some official support for the Rachio 3 in ST. Anyone have any idea if that is in the works or what it might offer? I guess worst case, assuming the status is returned to ST but simply not exposed, I can take the time to write a Smartapp that collects the status and simply rebroadcasts it as a push. But I have not investigated to see if what status is actually coming back to ST.
I’ll let the Rachio team respond on the official ST/Rachio roadmap. Personally, I think the notifications from the Rachio app are very timely. ex. Schedule about to Run, Schedule Finished, Rain Sensor tripped, and the new flow meter will push even more messages about water usage/potential leaks. I might just not be understanding what specifically you are looking for. In the meantime, if you look at the devices created by the app in the Smarthings IDE, you’ll see that plenty of data/options are known to Smartthings. You could probably use WebCore to automate push notifications when conditions you care about change. As far as notifications from the Rachio app, it’s not that the Rachio app doesn’t work but rather that I just want to see everything in ST instead of lots of different apps. Plus of course the ability to customize what alerts I want to see. That’s it, just granular control under one place. I’m still trying to figure out what screen you see in the app that shows all of your device history on “one pane of glass”. Can you post a screenshot? @tonesto7 Thoughts? @tonesto7 wrote the plugin for us. 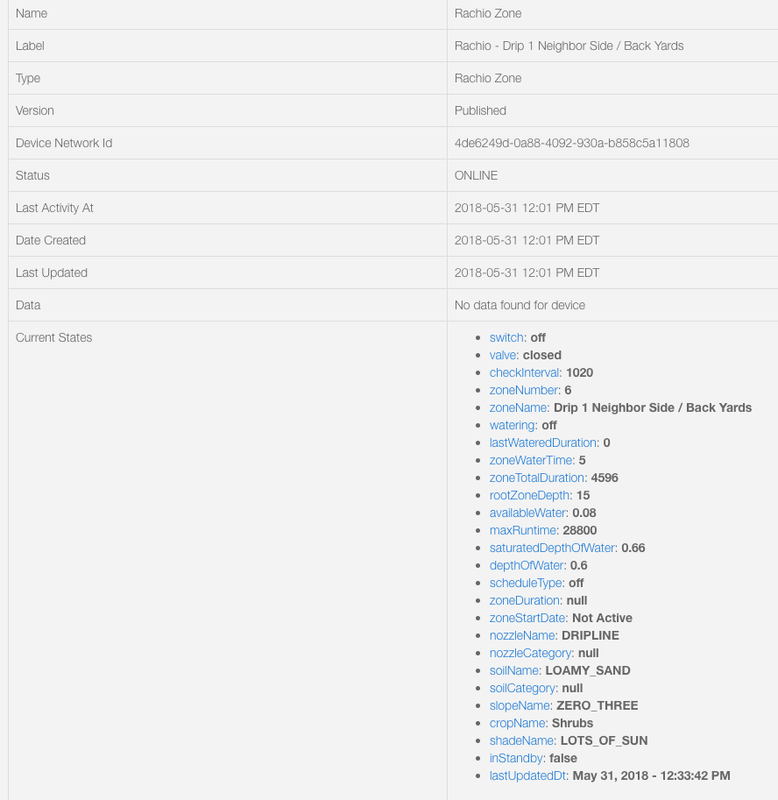 Yeah, so what you’re looking at is the Device Status aka the ST debug-level logs for a device. Very chatty. What I’m talking about is basically the log where all push messages show up. Most of what is there by default is what the SHM is doing (Good Morning, I’m Back, etc.) but what also shows up there is anything that comes to you as a push. 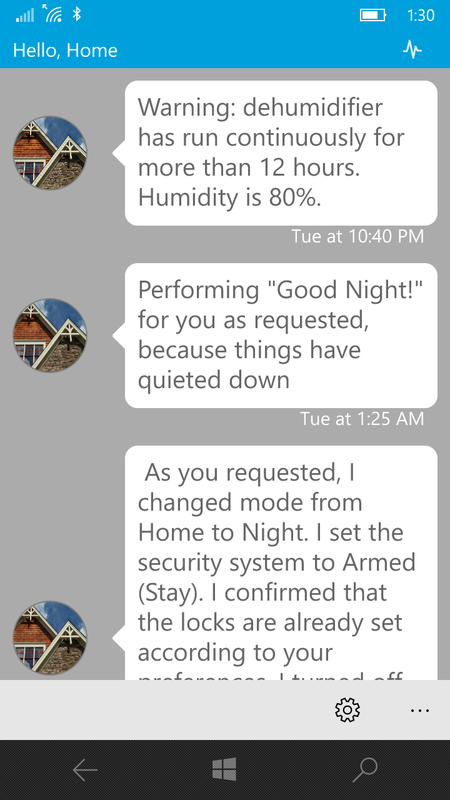 I’ve written a couple of apps that control my Sump Pump and Dehumidifier that, for instance, log a lot of chatty things at the “debug-level” but also send me alerts when some condition of note is met. Here’s a screenshot of what I am talking about. Apologies for the older version of the ST app - that’s another story altogether. I’m guessing in the iOS app this would be under the Dashboard but since it is also the place where all SHM alerts show up it would be in proximity to that. 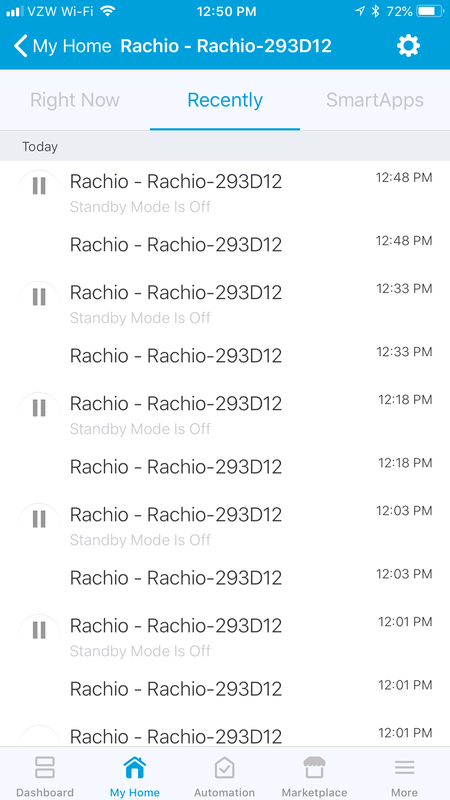 I’d love to see Rachio alerts about skips and leaks and so on here also. Wow, what are the odds? The same 2 bros from the ST forum that I just mentioned. Lol. I don’t think the app has a “Hello, Home” tab anymore. 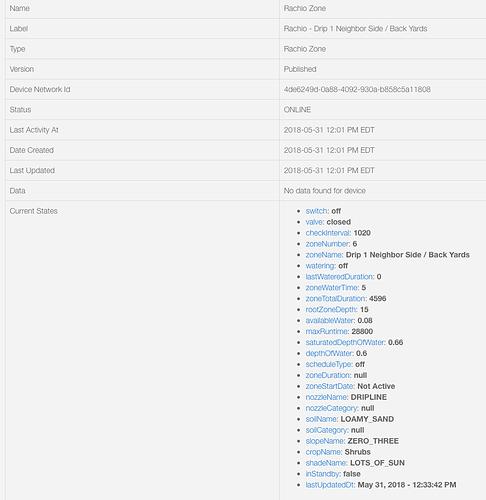 Under Notifications, you can see an activity feed which includes devices status on a single pane. You can also see messages that are sent via apps. My guess is you’re asking that Rachio include the option for more Messages to be delivered. Right, the option to have some “alerts” which would end up in the “Messages” tab there on the left which is what I think is the successor to the old Hello Home. The activity feed on the right is raw data which is cool if you want to see the day to day what happened but you would lose something important in there. Basically, there would be little to nothing in the Messages tab if everything is running A-OK or, like you mention, you enable the ability to be alerted when sprinkler zones start and stop. @LLWarrenP So you are looking for events for Controller/Zones to Show under the device activity and messages tab? In a less debug fashion? Yes, I was hoping to have the option to get a push message for all the various events which then ends up being historically logged in the Messages tab (aka Hello Home on the old ST phone app). I’m thinking mostly about critical ones like leak detected, low flow, or something similar. Honestly, there aren’t that many messages so it would probably make sense to have options to enable push for all of them in a granular way. True dat on the Win 10 Mobile app!